Disclaimer: This is an independent piece and has nothing to do with the official weekly TL Proleague recap. Everything in this recap relevant to players performing well or badly is usually referring exclusively to their expectations in FPL. I could give this to just Maru, but that would be really predictable and not really correct. Classic's +8 is superficially equal to Maru’s, although Maru is on five more FPL teams and just 2/7 of the anti-teams. Additionally, their tie is easily broken in Classic’s favor when considering their expectations. As Classic’s initial value ($6) was lower, it was in hindsight more profitable to buy him and spend the few extra FPL dollars on other players… like Style Start Sbenu. More on that later. 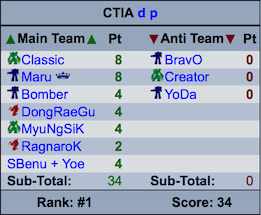 Classic loses a few points (thus, the tie) because he happens to be on 51 anti-teams compared to Maru’s 14. Looking back at his past FPL history, he always seems to be on a lot of teams, quietly gaining points. He is pretty much the opposite of RorO, quietly gaining a respectable number of points for anyone brave enough to put him on their main team. I’m not entirely sure why that’s true, since he’s notorious for not having a lot of fans and not causing anything exciting. If you picked one of the 911* current possible 0 point anti-teams, three random Sbenu players, and Sbenu, you’d be guaranteed to have at least 7 points which is better than 259 out of the 1542 existing teams (16.8%). If a certain producer of shoes that you happened to enjoy sponsored an ESPORTS team and you bet on them as much as possible, you’d be currently enjoying a 20 point team, which is enough to hover around the top 250. This mass-picking of Sbenu was totally possible, as for some reason all fifteen of their players and the team combined only cost 40 FPL dollars, and no one cost more than $4. As they put up a fairly strong lineup against the undisputed weakest team left in Proleague, Sbenu was nearly certain to win with their cheap players. Grabbing as many of their players as possible early was a good move for alert FPL’ers, as there were no surprises in the relatively easy 3-0 victory. This ended up leaving about 500 similar teams vying for first place, choosing between about 3 players, as hordes of people bought at least two of Bomber, DRG, and MyuNgSiK. The rest were left to contend for scraps, although one brave soul only had DRG of the big three and still managed a starting top 10 spot. In the wake of this Sbenu apocalypse (Sbenulypse? ), lots of people ended up buying multiple aces with their leftover piles of money. *I calculated this by hand, so the exact number might not be 100% accurate. No, I will not list all of them. This is why investing in expensive players is so risky, especially when they’re facing other expensive players. If Life had won, his opponent, Rogue, would have been be the only $8 player with zero points to his name and an initial investment in him would be an absolute nightmare. Additionally, Maru would have gotten one point instead of eight since KT would have won 3-0 instead, and Zest/KT would have been a far better investment than Jin Air. Although not too many people were unfortunate enough to hold Life himself, the effects of his loss messed with the entire scoreboard. It puzzles me when everyone in the KT lineup was in the lineup last week, and the week before, and the week before that. Usually, people want Flash to be traded out, but he was the only one that performed. Stats played pretty badly against Maru, Zest crumpled in the ace, and TY failed to convince the KT coach to finally field him. Let’s also not forget First, Super, and PenguiN, who have literally never been fielded for KT, ever. This is the closest attempt to a perfect no-trade team I’ve ever seen. CTIA, like many others, predicted the Sbenulypse, but he also figured out both ace wins. Maru was obvious for those shooting for the absolute top, as an ace match against KT looked likely and they always field Zest for some reason. Classic was a bit more of a stretch, but he was favored to beat Center and the two SKT Terrans had been extremely unpredictable recently. Unfortunately, his sixth man was RagnaroK. If he had chosen HerO instead, he would have one more point and the best possible team for the week. Better luck next time! For some reason, there seems to be a few more people aiming for the last spot rather than the first spot than usual. I suppose that with Prime being the worst team left and various aces established, it’s pretty easy to pick six prime players and anti-team herO. Well, too bad, because I’m ignoring you guys except for FFW_Rude. Remember that sometimes there’s a fine line between fanboyism and outright FPL suicide. Speaking of which, I can’t really tell where y54’s team falls. The anti-team, which checks out to 13 points, is pretty bad, but none of those players are extremely clear aces like herO or Maru often are. His main team, similarly, contains at most half an ace in sOs, while sporting an extremely pricey Jin Air set. Surprisingly, he decided to ignore Maru in favor of getting as many expensive and completely worthless Jin Air players as possible even though they weren’t playing. His team is rounded out by two 1 pointers that won’t play on teams that won’t win… unlike Sbenu. It was really easy to escape with a 0 point anti-team for this week. Nearly 300 teams have one, and with plenty of seemingly overpriced players like Panic, even I only lost one point. Although 911 possible combinations sounds like a lot, consider that nearly 300 of those have Life and most break some hidden rule of adding up to 13 FPL dollars. There weren’t any surprises, however, so the hundred or so remaining 3-player mixes were pretty easy to find. There were three -13 anti-teams belonging to some of those guys who don’t realize that Classic and Bbyong are actually good. Unfortunate for them. This made distinguishing the real teams from the pure baloney really easy for me. Almost all of the bad but legitimate teams had an anti-team with Classic in it, while the silly last place finishers tried mostly Maru, herO, and INnoVation. Even so, INnoVation might end up being a pretty solid anti-team pick with how his form has been. Agreed. I think it will depend on the lineups for me.